After watching this movie, I can truly say the child in me has not left. With a wholehearted recommendation of this movie, I hope that everyone who makes their way down to the local theater with a ticket to this film discovers their inner child emerging as well. When looking for a film to review, I quickly scrolled past a movie called “Trolls;” the name made me not even want to consider. However, with a constant nagging from my friend, I reluctantly agreed and did not regret one second of it. A movie bursting with color, flourishing with recognizable sing-along songs and pure joy, this film finds a way to lift your spirits in the gloomiest of moods. Although I can definitely say it was predictable in every way, it was also worth every cent. Following an invasion of the Troll town by the troll eating monsters, the Berghans, the trolls found themselves seeking refuge in hiding. However, years later, they are discovered by an evil Berghan who captures some of their most treasured trolls. Poppy (Anna Kendrick), the ever so happy Princess troll, embarks on a journey to save her friends, soon joined by a world hating troll, Branch (Justin Timberlake). Through their adventure they encounter many bumps in the road, and find themselves seeking assistance in a troll who releases sympathy on their journey. A movie with five cups of song, nine cups of joy, a pinch of deception, and a splash of female empowerment, this is one for Disney’s books. The film earned a 7.7/10 IMDb rating, earning a gross revenue of $158,404,682 in the worldwide box office. 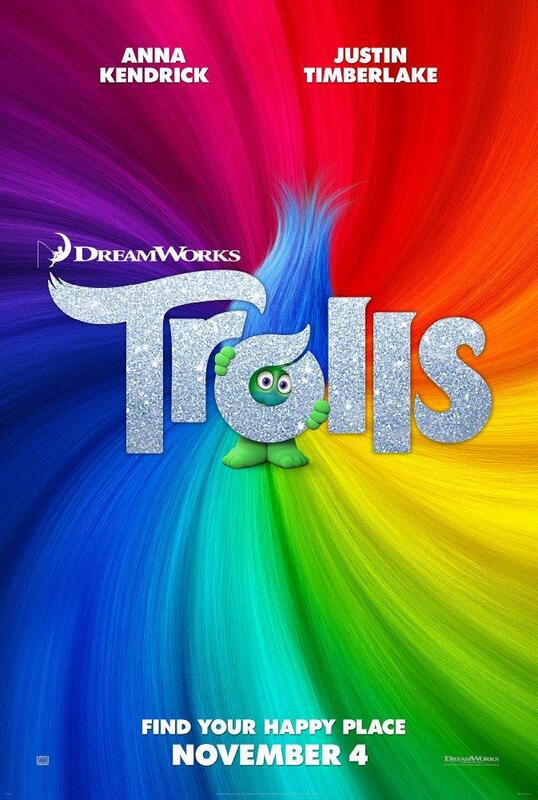 The movie lasts a good 93 minutes and consists of a multitude of distinguishable songs voiced by various popular musicians including but not limited to Justin Timberlake, Ariana Grande and Gwen Stefani, that you can find on the soundtrack titled “Trolls.” Although I typically do not enjoy movies that break out into song every few minutes, this one found a way to make it work. In all, I, as a high school junior student would recommend this PG movie to any of my fellow student body members. Yes, I would normally prefer an action packed, more my age movie, but nobody can go wrong with some younger sibling bonding time at the theater if it’s for a great movie.